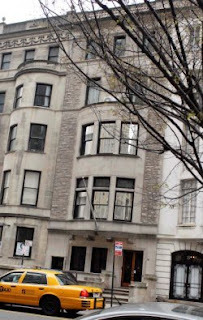 Looking slightly forward for a minute, come Friday and his "transfer" to New York, Benedict XVI won't be staying at 452 Madison -- the residence of the Gotham archbishops -- but at the 20 East 72nd Street "Mission House" (right) of the Holy See's UN Observer, Archbishop Celestino Migliore. Lest there be another spate of misinformed articles (e.g. the "snub" that wasn't involving the White House dinner to be held in the Pope's honor, and his absence, tomorrow night) it's nothing against Cardinal Edward Egan, but another aspect of Vatican protocol that, whenever the pontiff's traveling in a city where the Holy See maintains a nunciature (i.e. the residence of one of its ambassadors), he stays there. Period. This is why nunciatures are often referred to as "The Pope's House," and when he was the papal representative in Jerusalem and the Holy Land, Papa Ratzi's host for the trip's first leg -- his nuncio to Washington Archbishop Pietro Sambi -- forbade long-warring factions from speaking ill of their fellow men there. The leader of the Vatican's stepped-up "green" initiative and a former holder of the Holy See post equivalent to "deputy foreign minister" (formally, undersecretary for Relations with States), the 57 year-old Italian was transferred to New York and made an archbishop in 2002. On a trivia note, since Switzerland changed its status to become a full-fledged member state of the global organization in 2002, the Holy See -- which, per international law, remains a politically neutral entity -- is the lone state to sit in the UN as a non-voting delegation with "permanent observer" status, an entitlement dissident groups within the church itself have campaigned against. Pope Benedict is unlikely to discuss specific world trouble spots but will assail the notion that "might is right" when he addresses the United Nations next week, a papal envoy said on Thursday. The German-born pontiff's speech in the General Assembly when he visits the United Nations on April 18 during a five-day visit to the United States is certain to be scrutinized for any reference to current political topics. But the Vatican's permanent observer at the world body, Archbishop Celestino Migliore, said Benedict would focus on more general issues of peace and human rights. "Pope Benedict won't necessarily touch upon specific crises in the world: unfortunately, they are too many to be dealt with in a few minutes," he told an audience of nongovernmental organizations and journalists. "But surely, coming to the U.N. as a pilgrim of peace, he will say that we cannot base our relations on the false notion that might makes right, that we cannot build our future on a simple balance of power," Migliore said. 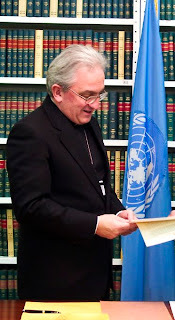 "The papacy ... works at the U.N. ... above all by highlighting and insisting on essential values and fundamental rights. I can anticipate that next week Pope Benedict will do just that," Migliore said. 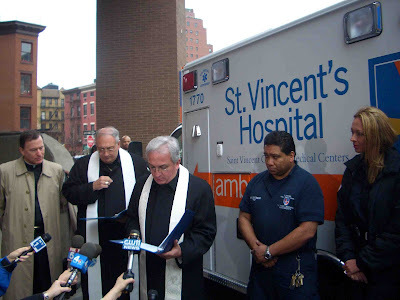 On a related note, early last week, the archbishop-observer was joined by Bishop Nicholas DiMarzio of Brooklyn to bless the ambulance that'll be used in the papal motorcades for the Gotham leg of the trip. Don't get too worried; an ambulance is always a part of the line of cars as a precaution. Commissioned by St Vincent's Hospital in Lower Manhattan, after its turn in the spotlight, the brand-new car will join the hospital's regular fleet.